Out of all the Tales from the Crypt episodes, and I’ve seen them all, multiple times, I’m really not sure why “House of Horrors” always stuck with me the longest. Sure, it’s not the best episode, far from it, I would maybe give that honor to “The Ventriloquist’s Dummy” or maybe even “Mourning Mess” but there is something about the tone and acting that seemed so odd and cheesy that it worked perfectly. 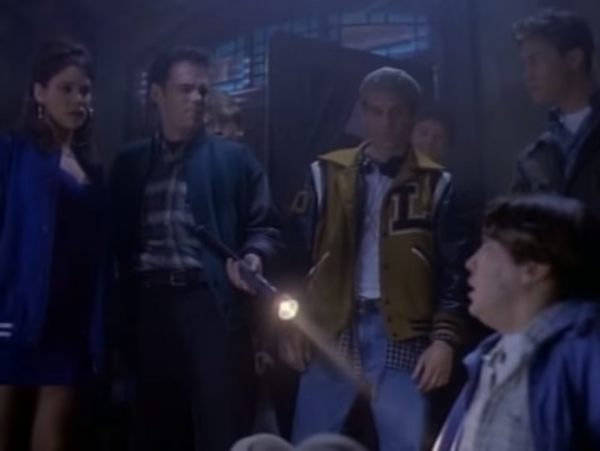 “House of Horrors” from Season Five of Tales from the Crypt about so-called college Greek life, namely fraternity Gamma Delta and sorority Delta Omega Alpha. On the night of initiation, pledges from Gamma Delta arrive at the old Cougher House, a supposedly haunted house where nine pledges from Alpha Sigma fraternity were murdered with an ax. Little do the pledges know that the house is rigged with tricks to make them think that the house is actually haunted, but when severed arms are thrown through windows and the screams sound a little too real, are those fraternity tricks real or is the Cougher legend real? Come the end, the truth of the Cougher House is revealed and Delta Omega Alpha Invite Headmaster Les Wilton to dinner in the attic. This episode features a who’s who of early 90s Hollywood, including Wil Wheaton, Jeremy London, and the obnoxious Kevin Dillon as Headmaster Les Wilton who is the obligatory “guy-who-gets-his-in-the-end.” The other interesting tidbit is that this episode was written and directed by Bob Gale, who most everyone should know as the writer of all three “Back to the Future” films. Of course this makes more sense being that Robert Zemeckis, the director of the “Back to the Future” trilogy was also one of the executive producers for Tales from the Crypt. I’ve always felt that Season Five of Tales from the Crypt was also one of the strongest in the series, with the proceeding seasons getting weaker and weaker and ultimately leading to it’s cancellation. The camp element of “House of Horrors” is what really gets my attention. Sure, most, if not all, episodes of “Crypt” are pure camp and essentially a Grand Guignol exercise, there is something special about this episode. I think it might be the only episode that deals with college Greek life which has always been something mysterious and sinister, so it fit so perfectly. Also, while “Crypt” has had its fair share of villainous characters, I find Les Wilton to be one of the most repugnant and memorable in the series’ run. “House” is ranked near the top for me in Season Five, maybe right behind “Creep Course” which I would put at number one for the season. It’s highly re-watchable, fun, campy, and the ending has a nice payoff. This was an episode I hadn’t gotten around to yet this year. It sounds vaguely familiar so I do think I watched it when I was younger but I don’t remember too much about it anymore. Glad to have you on board with this!